To demonstrate this, they applied a so-called "fingerprint" technique. Fingerprinting seeks to separate human and natural influences on climate. It relies on patterns of climate change—typically patterns that are averaged over years or decades. But in the new research appearing in the July 20 edition of the journal Science, the team studied seasonal behavior, and found that human-caused warming has significantly affected the seasonal temperature cycle. 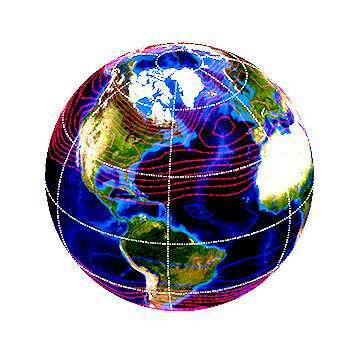 The researchers focused on the troposphere, which extends from the surface to roughly 16 kilometers in the atmosphere at the tropics and 13 kilometers at the poles. They considered changes over time in the size of the seasonal cycle of tropospheric temperature at different locations on the Earth's surface. This pattern provides information on temperature contrasts between the warmest and coldest months of the year. "Our results suggest that attribution studies with the changing seasonal cycle provide powerful and novel evidence for a significant human effect on Earth's climate," said LLNL climate scientist and lead author Benjamin Santer. Earth's climate is simultaneously affected by different external and internal factors. Examples of external influences are natural changes in the sun's energy output and human-caused increases in atmospheric concentrations of greenhouse gases. Internal influences include a wide range of natural cycles, such as the El Niño/Southern Oscillation and the Interdecadal Pacific Oscillation. Variations in these and many other internal and external factors have driven changes in historical climate. In the new research, the team examined model simulations driven by historical changes in human factors. A prominent feature of these simulations is that at mid-latitudes, the size of the seasonal temperature cycle increases markedly. This increase results from larger warming in each hemisphere's summer season. In turn, larger mid-latitude summer warming appears to be partly due to summer drying of the land surface. Because of differences in the heat capacity of land and ocean, and because there is substantially more land in the Northern Hemisphere, mid-latitude increases in the seasonal temperature cycle are larger in the Northern than in the Southern Hemisphere. Similar large-scale patterns of seasonal cycle change occur in satellite tropospheric temperature data. The "pattern match" between the human influence fingerprint and the satellite patterns of seasonal cycle change was highly significant. The match was unlikely to be due to natural internal climate variability. One more example of Santer trying to pass off one of his arcane computer models as empirical observation. I think he's actually trying pass off the empirical observations as empirical observations. The physical model results just significantly match the empirical observations, which is nice, and gives insights into the empirical observations. Given that it's been shown that even simple physical models do a good job at matching the observations, it's been a while since I've heard the anti-science movement claim models have problems. But oftentimes this information takes a while to trickle down to the lower echelons of political movements. Yep. It seems like all of the climate change deniers lost interest as soon as their Russian funding ran out. The models track measured temperatures nicely from 1980 to 2000, which they should since they were calibrated to do that. But after 2000 they predict much more warming than measured and they continue to diverge more from measurements each subsequent year. Using CMIP5 models to identify a human signature in temperatures is ridiculous given their demonstrable inaccuracy. Then mapping that false human signature onto measurement data and claiming that it shows a human influence is scientific prestidigitation. Or scientific malpractice. What will it take for aksdad to stop posting links that directly contradict his point? This is an easy one! He should actually read what he links to!! Unfortunately, he is too caught up in his own personal belief to actually read about the subject. He already knows, you see. There is nothing left he can learn. I ponder a world were aksdad is not a professional troll but is, in fact, a normal person who just can't read a graph. Poor, sad, innumerate aksdad. Unbelievable that this science site is promoting global warming. More unbelievable is that so many people bought this scam, simply unbelievable. Poor little CO2...do you people understand that CO2 is colorless, odorless and not toxic? It is heavy, 1.5 specific gravity. Air is 1.0. THINK about that. Like Propane gas CO2 seeks the lowest spot possible pushing the air out of a 'hole' and no air no animals can live. There is only 400 ppm CO2 in the atmosphere and I still don't know how they test THAT aspect because CO2 is a 'poorly mixing' gas...before mankind, atmospheric CO2 was an awful lot higher 2000 ppm. Happy plants, happy oceans no 'greenhouse' heating. If we get down to 150ppm plants will die then we all die. Do you guys know about the Grand Solar Minimum we are now in? Happens every couple hundred years like clockwork. Look up the Maunder, Centennial, Dalton and the current one is Eddy. We are well into a Global Cooling. Why we weren't getting ready for this is amazing.